Omg! That is awesome!!!!! Thank you so so much! Fast and customer friendly service!! A condolence wreath is a more formal sympathy tribute that is sent to the Funeral on behalf of a Company, Organisation, Sports Team or close family member. A wreath is a traditional representation of a never-ending circle of love and respect - Unbroken. This makes it very symbolic for rememberence flowers as a mark of respect in this time of bereavement. 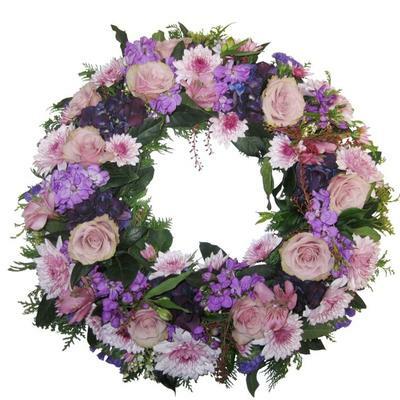 We can make a funeral flower wreath in any colour - including our Logo Wreath, which we can also add your company logo, colours or ribbons to match corporate branding, or sports team colours as a more official commemoration. If you are looking for delivery Today to a Funeral in Auckland - please call us on 09 838 9058 to check if we are able to get to the funeral on time, (due to Auckland's large spread location and the floral couriers deadlines). Your flower wreath will be delivered on-time to the Funeral with your condolence message tastefully displayed in a covered card-holder.